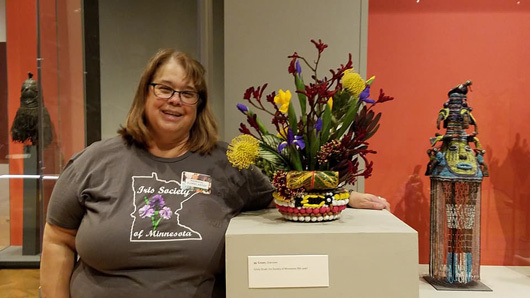 Cindy Soule was again sponsored by ISM at Art in Bloom 2019 at MIA. 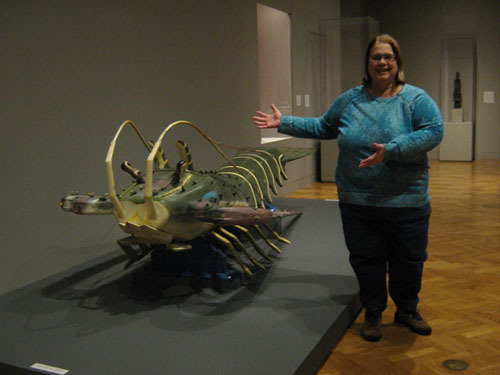 at Minneapolis Institute of Art, 2400 3 Ave. S. Minneapolis. 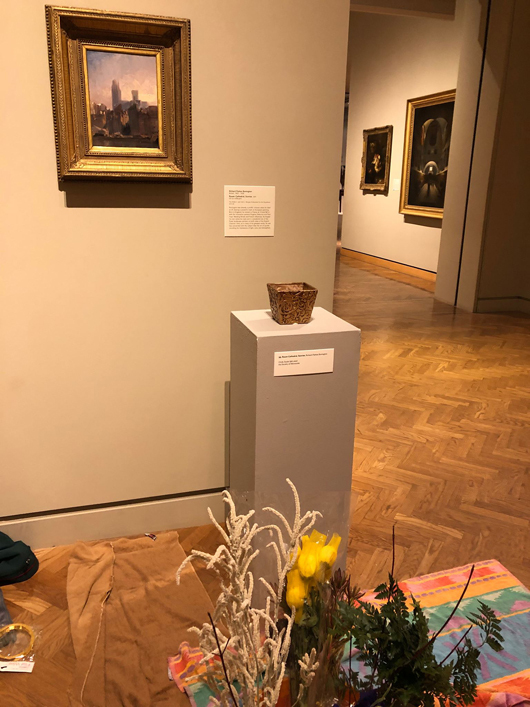 The painting Cindy is representing and the empty vase she will fill. 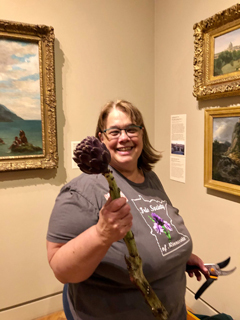 "Yes, it's an artichoke." 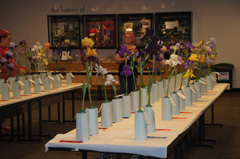 At right, the vase in progress. The finished representation, itself a work of art. 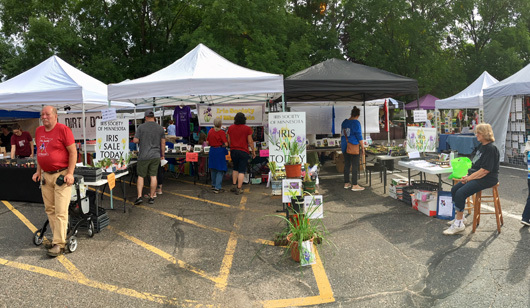 Another new initiative this season was selling irises at the Northeast Minneapolis Farmers Market. The ISM booth looked fabulous! 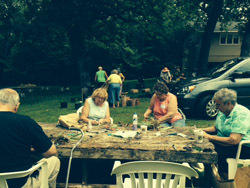 The 2018 Arboretum sale was a big success. 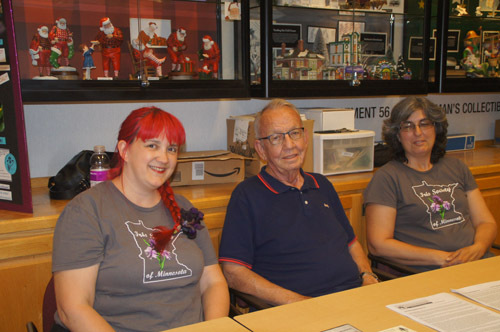 Katerina Bergeron, Jack Worel, Tim and Gerry Moore, and Holly Johnson. 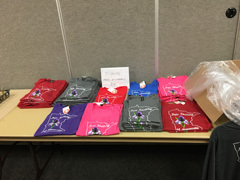 We added several new members and sold some shirts as well! We apologize for the poor quality of the photos. Lighting was poor. Thanks to everyone who entered or attended our annual show! 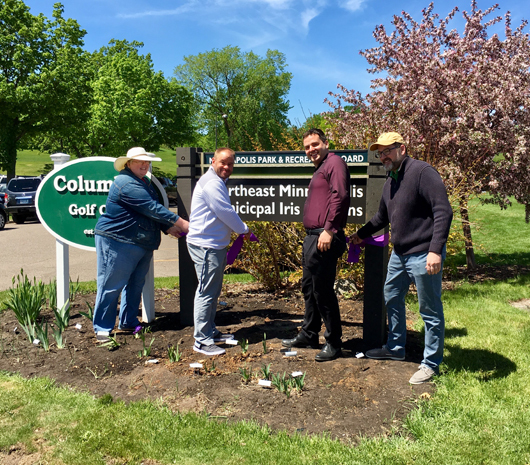 Left to right: Liz Wielinski, former park commissioner, who was instrumental in finding and securing the location; Joe Green, General Manager of Columbia Park and Golf Course; Commissioner Chris Meyer, Park Commission, District 1; and Council member Kevin Reich, City Council member, Ward 1. 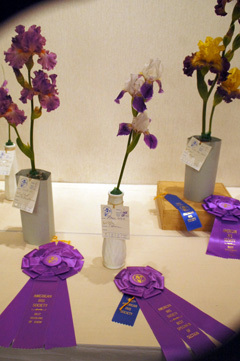 Seven people entered 67 iris in the early Show. 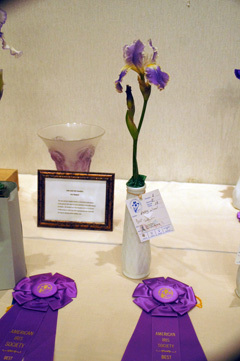 The Queen of Show was won by Marte Hult for the SDB Jive. 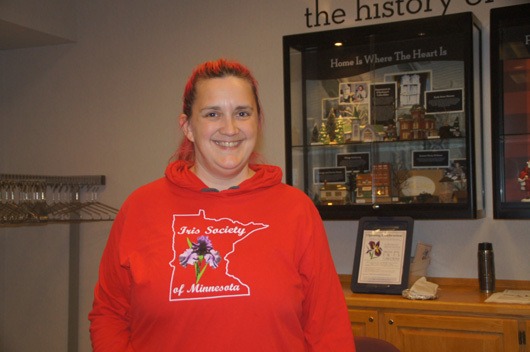 Michele Dreier won the Miniature Dwarf Section with MDB Beetlejuice. 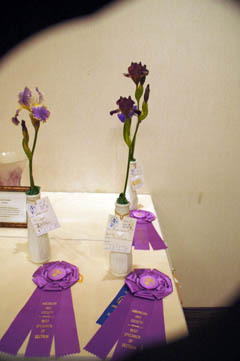 Tatiana Allen won the most blue ribbons for the Silver Medal. 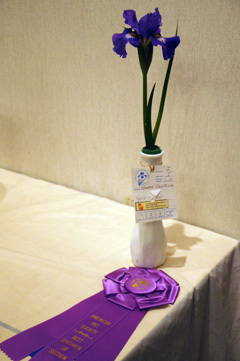 Marte Hult won the Bronze Sweepstakes Medal for second most blue ribbons. Alicia LaMunion, Jack Worel, Tatiana Allen and Marte Hult also won special awards. 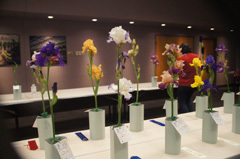 Thanks to all for entering the show. 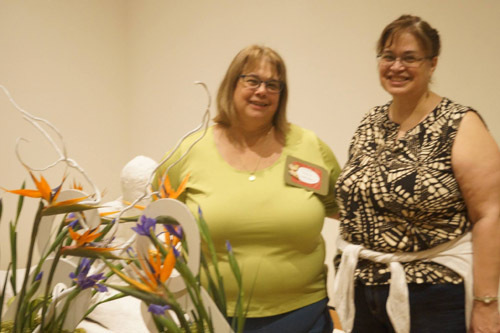 Carol Jensen from the local newspaper, Northeaster, wrote a lovely article in the May 30 issue about the new iris garden and the early show. Read it here. 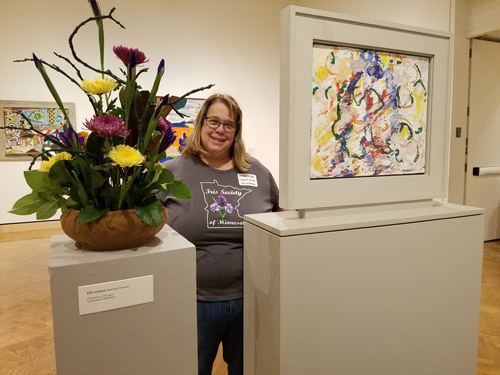 Once again this year, ISM is sponsoring Cindy Soule's interpretaton at the Art in Bloom event at the Minneapolis Institute of Art. 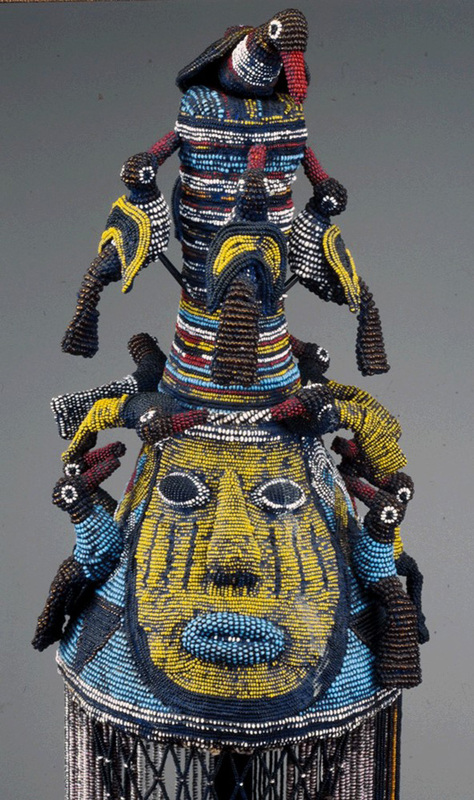 Cindy writes: "I am interpreting a beaded mask named 'Africa Kings mask' for the Art in Bloom event. 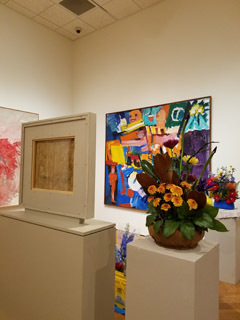 It is located in the Africa gallery #250 There are actually two masks that will be interpreted in that gallery, probably with iris in the design. 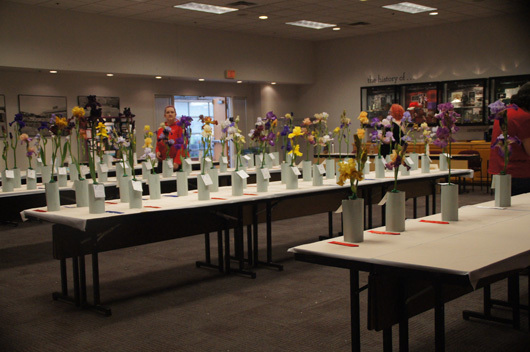 One of the people I mentor for floral design is doing the other one. It is called 'Mask Twabe.' 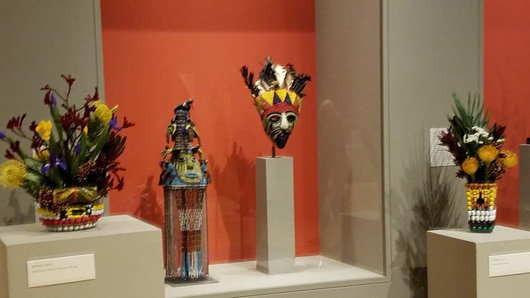 The two beaded masks are behind glass and in the same display." 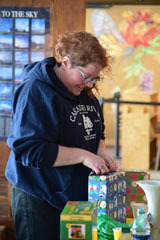 Cindy is planning on doing a beaded treatment of the container to mirror the art work. 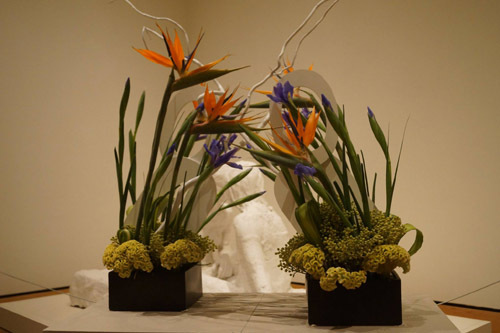 Then she will use iris, African and other tropical flowers and foliage to interpret the art work. 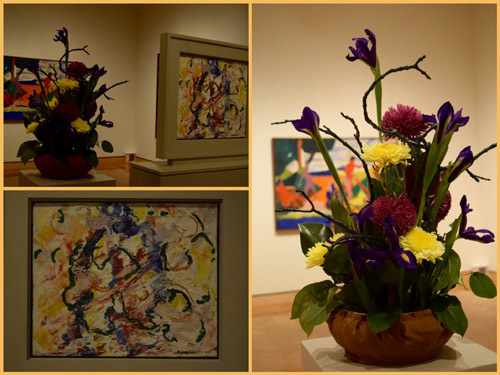 Art in Bloom begins Thursday April 26th and runs through Sunday April 29. 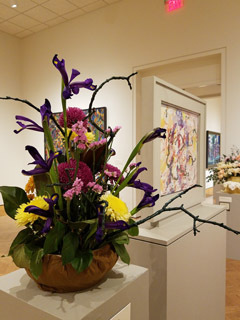 This year there will be evening hours on Friday; and a gala opening in the evening on Thursday. 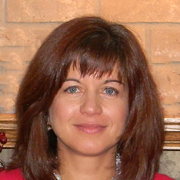 Cindy will be doing her design on Wednesday the 25th until 2 PM. 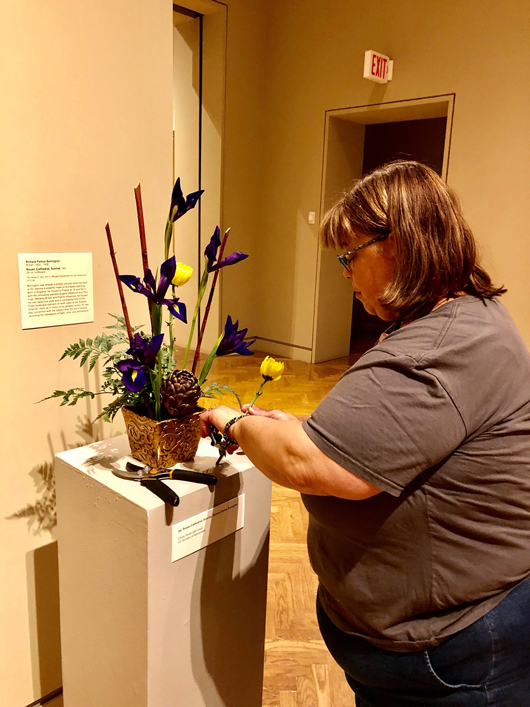 She says that Wednesday is a good day to see the designs without the crowds, and it's fun to watch the pedestal artists doing their work. Everybody head over to the Art Institute to catch this great show! It's always spectacular. 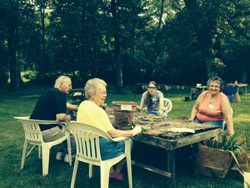 The annual dig on August 12, and the sale on the weekend of August 19-20 was very successful. 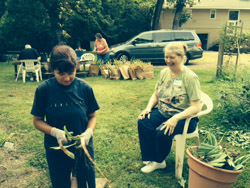 A big THANK YOU to all of the great volunteers. We had a very good response and many willing hands. 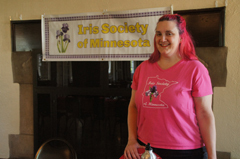 There are photos from the dig on the Iris Society of Minnesota facebook page. 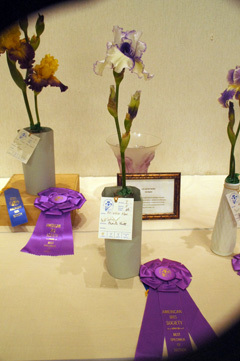 SHOW UPDATE: We were advised that a seedling could not be voted Queen of the Show. 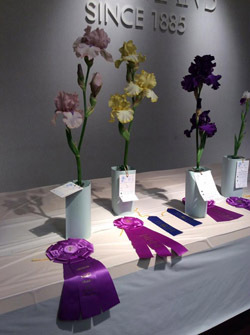 The judges consulted and selected Jenn Lanz' I. Tectorum alba as the Queen! 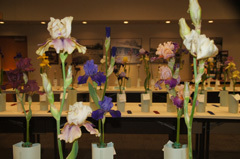 The ISM sponsored another successful iris show on Saturday, June 3. 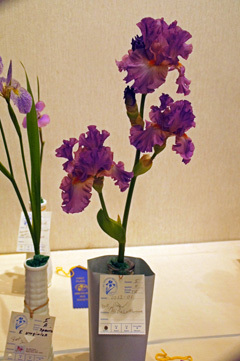 The Queen of the Show was a seedling (2013-01-03), and it is very unusual for a seedling to attain this honor. 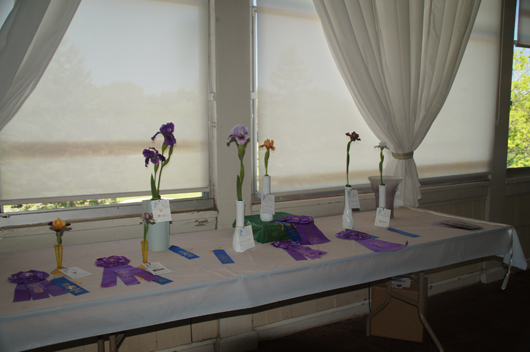 Congratulations to Alicia LaMunion, who, in addition to her seedling, had several award winning irises in the show! 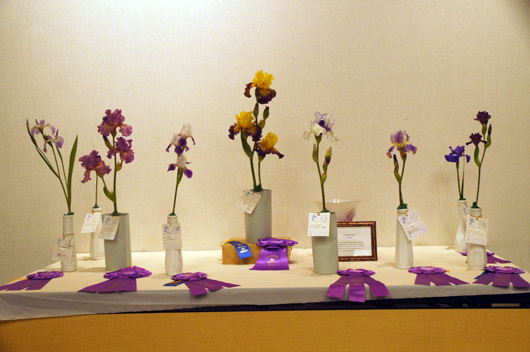 And congratulations to all who participated. 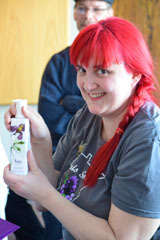 Here are a few photos, and ISM member Holly Johnson will be posting many more to our facebook forum site. 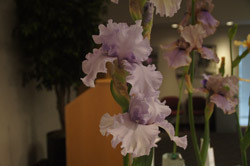 Holly is also posting photos of irises that are blooming this year at the Landscape Arboretum. 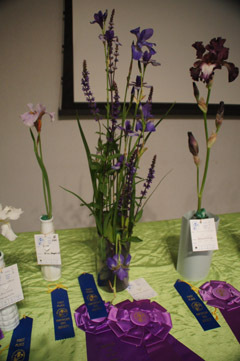 Historic TB iris Anointed (top) and TB Western Edge, just two of many fine irises entered in the show. See our Forum page for more. 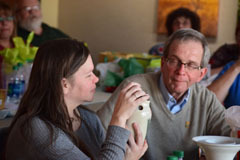 Over twenty members gathered at the Richardson Nature Center for our annual holiday potluck party and gift exchange. There was an incredible array of food and it was all delicious! 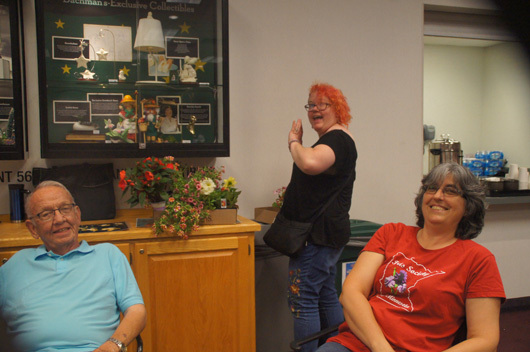 Most people were very polite during the gift exchange and there was very little stealing of gifts until the very end when the dahlia tubers were opened. Everyone immediately wanted them. Fortunately there were two bags! Thank you Jon and Cindy! 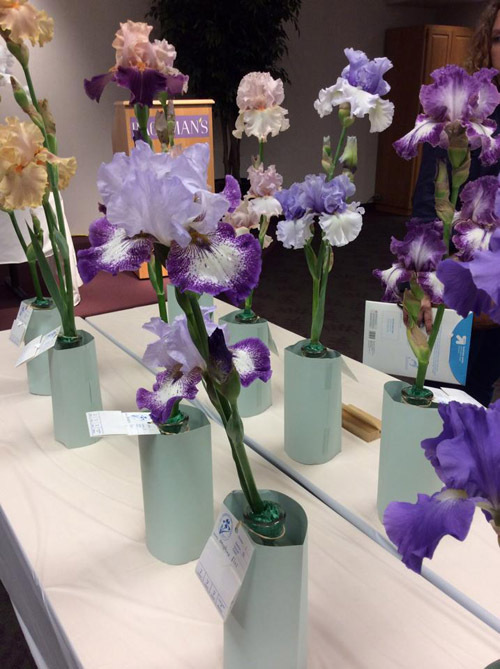 November 6th, 2016 we were fortunate enough to have Jan Sacks and Marty Schafer, hybridizers of Siberian Iris, and owners of Joe Pye Weed’s Garden presenting. 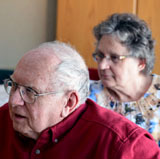 There were a total of 22 attendees to the presentation, two from as far away as Iowa. 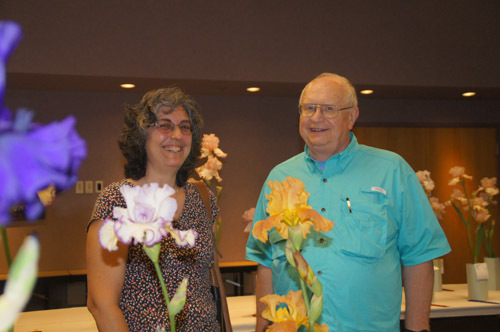 Marty and Jan have been honored by the American Iris Society by being presented with the Hybridizer Award in 2007. They have also won the Morgan-Wood Medal nine times from 1999 thru 2015. 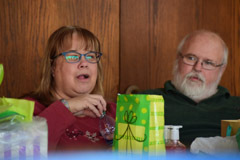 Marty and Jan live in a 19th century barn house. 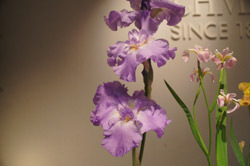 They have many companion plantings of perennials among their prized iris. 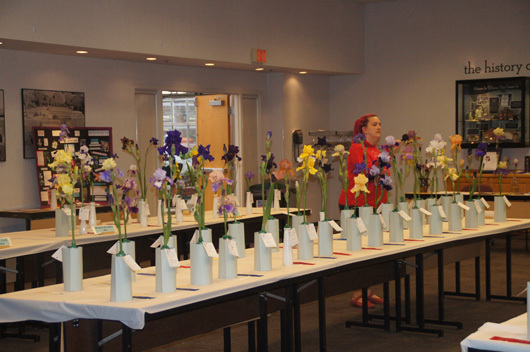 At current time, they have officially registered 138 new varieties of Siberian Iris. 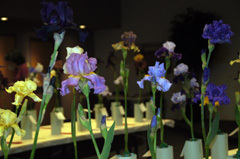 They have also officially registered 21 Species iris, and 5 Species Hybrids. 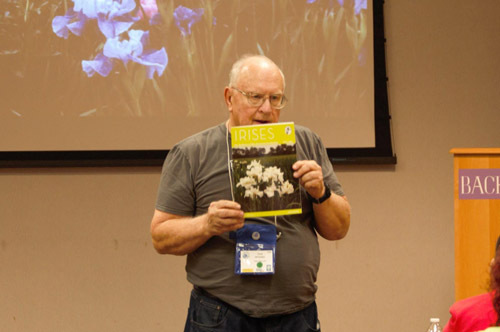 During the presentation, Jan and Marty displayed a picture that showed the starting point of a new year of growing their hybridized Siberian Iris. 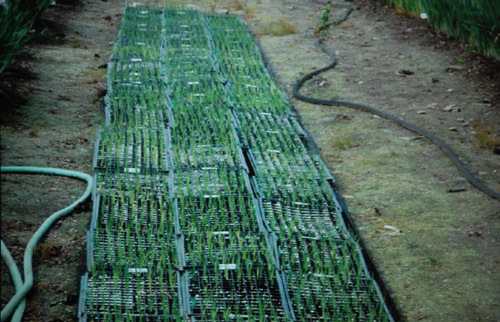 The picture showed about 60 seedling trays with 144 cells per tray. If all the cells were actively growing would equate to 8,640 new plants. 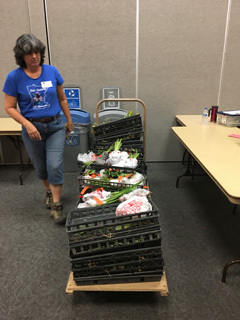 I noticed that in the foreground, some trays that were cut off in the picture, so this is not necessarily all the seedlings for that year. 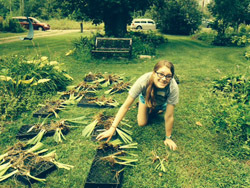 That is a lot of new iris plants! 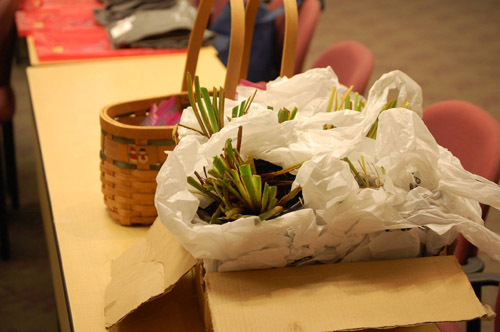 They mentioned that the biggest threat to the seedlings was rabbits, as they like to nibble on the new seedlings. They stated that it takes about four years, from the time the seeds are first planted, to when they have enough stock to sell any extras. During that time, there are many crosses that do not make the cut. The soil in their area is mostly a sandy loam, which is very stony. 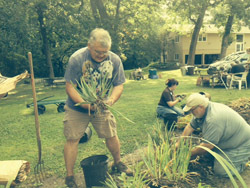 In order to conserve moisture, for their Siberian iris, they mulch between the rows with chopped leaves or Pine needles for mulch. They use wood chips only for paths, as they draw out too many nutrients from the soil, when breaking down, to use around the plants. 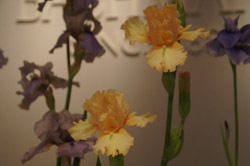 In 1976, Currier McEwen had hybridized a yellow Siberian iris, ‘Butter & Sugar’, for the first time. 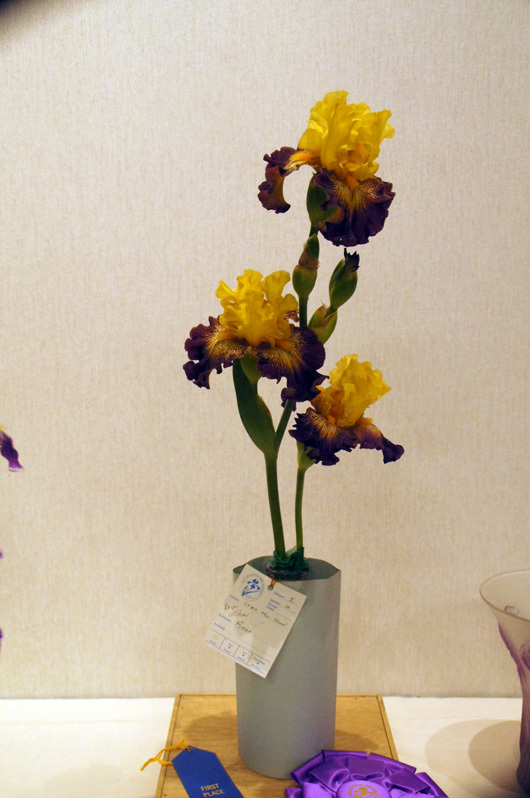 Before this there had been no other yellow Siberian irises. 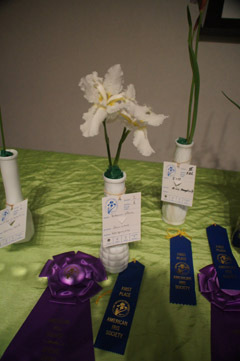 Even though this variety was officially registered with the Iris Society of America, and was awarded an Honorable Mention in 1978, the Morgan Award in 1981, and the Morgan-Wood Medal in 1986, it was considered by Jan and Marty as an inferior plant, due to the color being a pale yellow and the fact that there were only 2 buds per stalk. Jan and Marty set out to see if they could have any luck to improve upon this yellow Siberian. 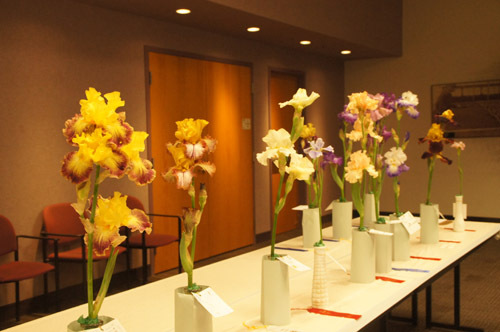 They had noticed that most hybridizers were trying to cross white irises with ‘Butter & Sugar’ to try to get better yellows, but they were not having very good luck at improving the color. Marty decided to go the other direction, and cross ‘Butter & Sugar’, and later other yellows, with his best blues to see what kind of results he could get with these crossings. 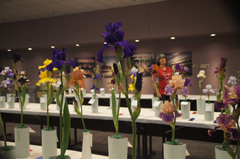 Marty and Jan had very good success with crossing the blue irises to yellow ones, and have since introduced many new varieties because of these crossings. 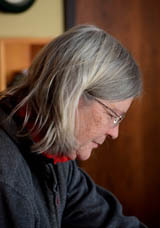 ‘Tree of Songs’ is one of their varieties, officially registered in 2006, which was awarded the Franklin Cook Cup in 2010, an Honorable Mention in 2010, an Award of Merit in 2012, and the Morgan-Wood Medal in 2014. While they were crossing their best blues with yellows, they noticed that some of the yellows they were getting were looking like they were overlaid with the blue. 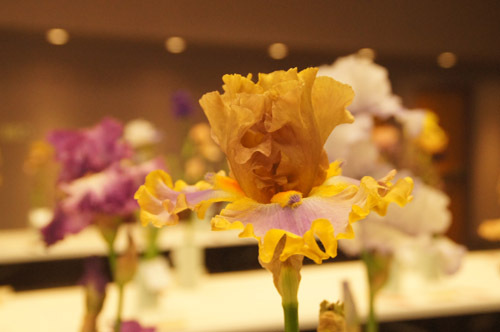 Some of their hybrids even had a gray coloring to them, to which Marty said something to the effect of, “never describe a flower color as gray, as they won’t sell, instead say the color is Heather, or something similar”. 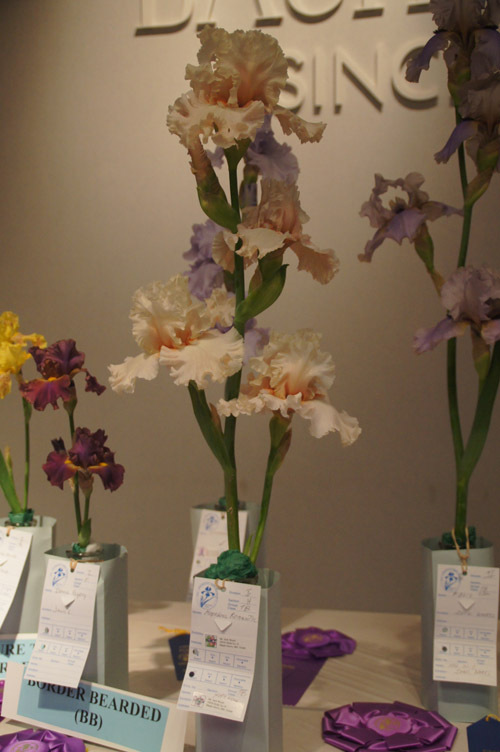 During this time, they also produced their first bi-colored iris, ‘So Van Gogh’, a variety with yellow falls and blue-violet standards and style arms. 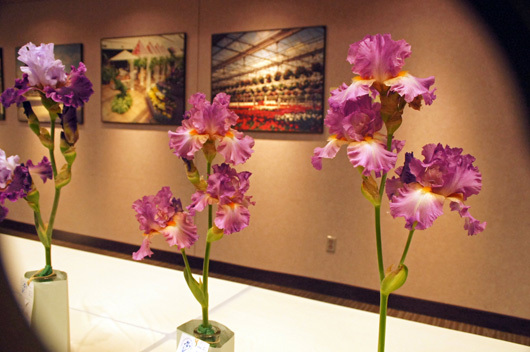 With their success of producing yellow iris that they felt were better in form, and had better bud production, they decided to try their hand at producing a better pink iris. 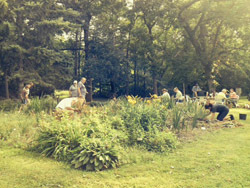 They used one of their seedlings, ‘Pleasures Of May’, as a base to build on, and crossed pinks with yellows. One of their latest hybrids, ‘Wynne Magnolia’ is a resulting offspring from one of these crosses, and Marty and Jan feel that this particular variety will make a good parent plant for subsequent crosses, as it produces many flowers of good substance. 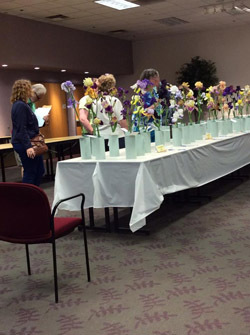 Because Jan and Marty felt ‘Wynne Magnolia’ has a lot of potential as a parent plant, they brought several starts of to give out as door prizes. Even with it being so late in the year for planting, they recommended that those who received them, after planting, cover them with a brick to keep the seedlings from frost heaving. Then in the spring uncover them to allow for growth. They found that this method has worked well for them when planting late in the year. 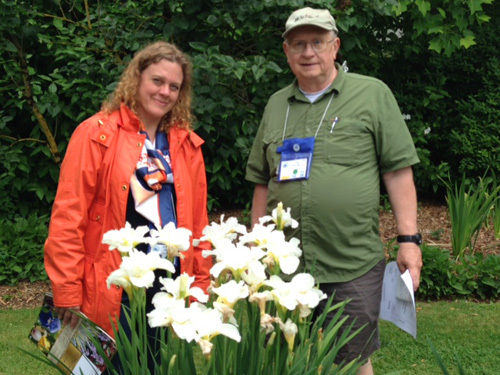 Marty and Jan found that when hybridizing iris, it takes 3 years for a plant to develop into its full potential. 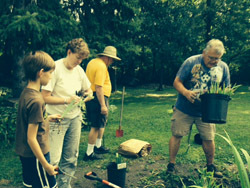 The first year of growth is spent on the plant developing from seed. 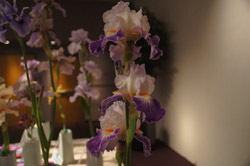 During the second year the flowers that are produced give the hybridizer a “peek” at the possible potential of a flower. 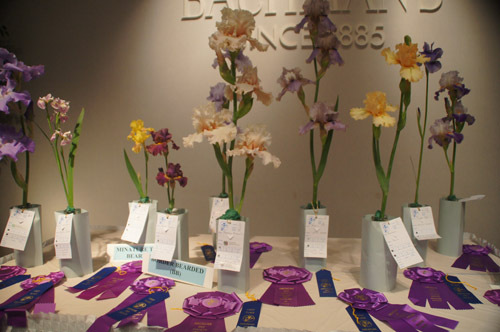 During year three, the flower production should have stabilized enough to decide if it is truly worthwhile to pursue to registration, or to add it to the compost pile. 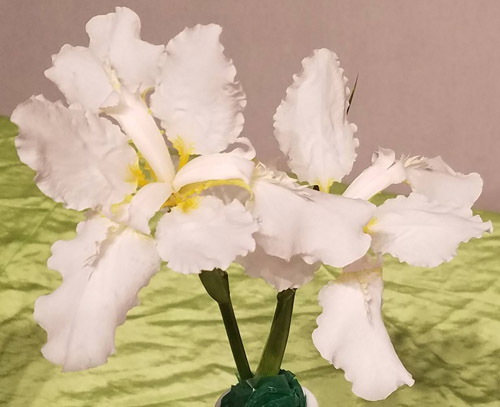 Over the years, Jan and Marty have grown some Siberian iris that have had re-bloom potential, but they have found that the flowers that are usually produced during the second bloom, are susceptible to Japanese Beetle damage. When talking about the Japanese Beetles, they mentioned that their area had had problems with Japanese Beetles for 20 years, and during the later part of this period, they noticed that the beetles were getting white spots on their heads. They found that this was a virus that was infecting the beetles, and since have started to have less of an infestation problem with the beetles. 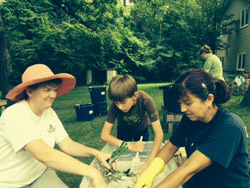 They also found during this time that a type of annual Knottweed, that they grew, seemed to deter the Japanese Beetles. This type of Knottweed is known as ‘Kiss Me Over The Garden Gate’. Something else that they found out about repeat blooming Siberians was that during years of cooler weather there seemed to be more repeat blooming. 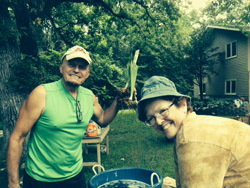 When starting out their seedlings after transplanting, Jan and Marty will water them often, until the roots take hold. One will know when this happens when there is resistance when tugging lightly on the leaves of the seedlings. After the roots have locked into the soil a bit, they cut back on the watering to weekly, then bi-weekly, eventually stopping all supplemental watering except in the event of a drought. They recommend the use of pearlite or similar substances, so you can water the plants often, but the plants won’t be sitting in water for extended periods of time. 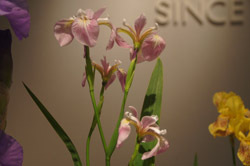 Even though the growth of Siberian Iris is better in moist soil, they do not like sitting in water logged soil, especially over the winter. 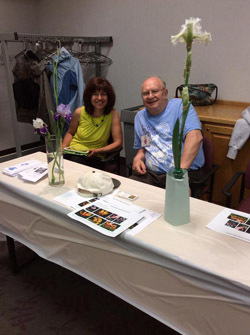 After their presentation on Siberian Iris, Marty and Jan had an additional presentation on Species iris. 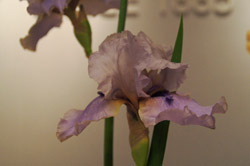 There are many different species of Iris that grow wild throughout the states. 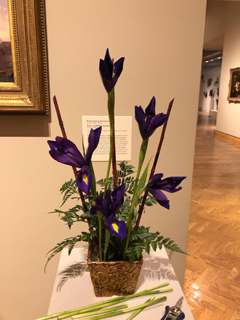 When on a trip through Exeter, New Hampshire, they found Iris prismatica growing wild. These I. prismatica were the first that Schafer & Sacks grew, and they later registered them as the variety ‘Exeter’ due to the location they were found in. 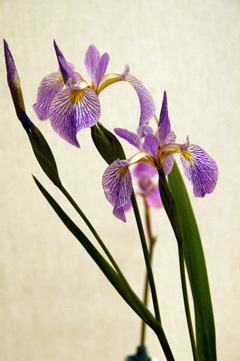 Even though Siberian iris are more favorably grown on a straight stem, they found that I. prismatica does not have a straight stem, and many other species iris commonly have bent stems too. They think this occurs because the plants are stoloniferous (growing from runners), instead of growing from a rhizome. 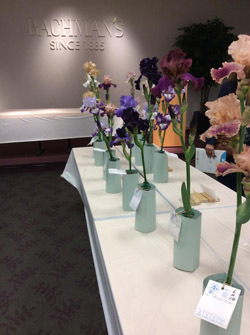 They mentioned if you have an area of shade that you want to plant iris in, but have not been successful, a good Species iris to plant would be Iris gracilipies. 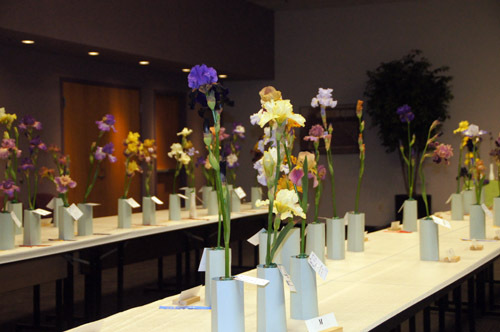 Other Species for partial shade would be Iris chinenses, and Iris cristata. 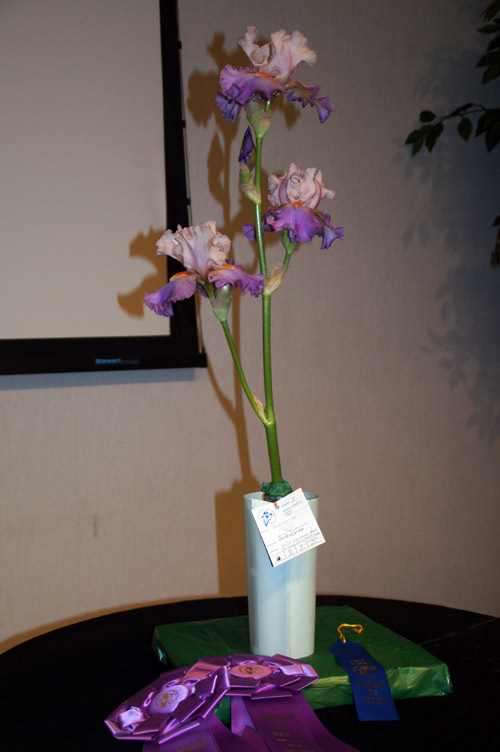 They found that it takes about 3-4 years for these species iris to grow into a good sized clump. 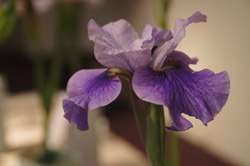 For iris to plant in wet areas, I. versicolor is known to do well. 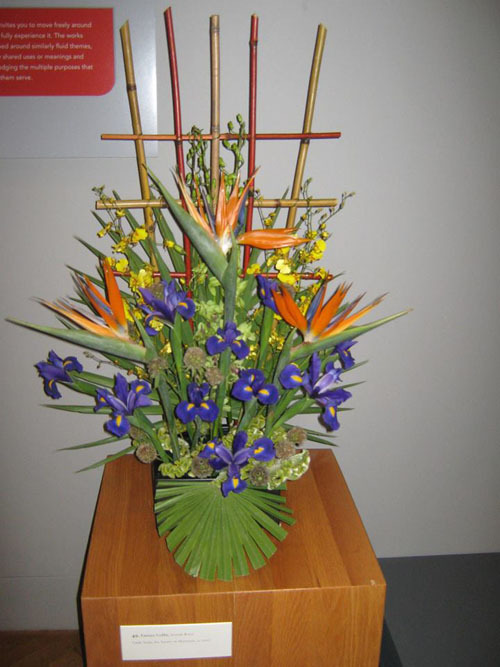 This plant naturally blooms over the water, when able, so that the seeds can naturally disperse by floating away. 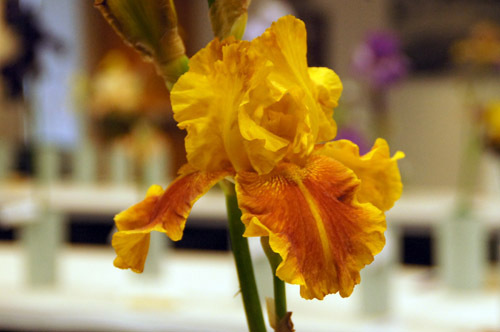 Jan and Marty felt that for those of us who want to improve upon our bearded iris, we may want to introduce a species iris into our hybridizing program. 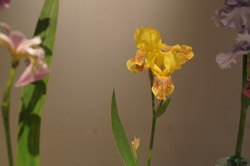 One that has shown a lot of success crossing with bearded iris would be I. aphylla. 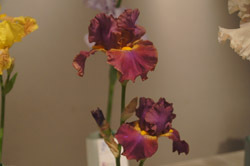 This species tends to add branching and hardiness to bearded iris. 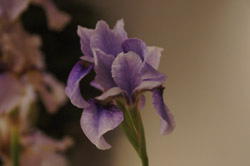 However, this iris is a little unusual, in that the leaves of I. aphylla die off completely in the winter. 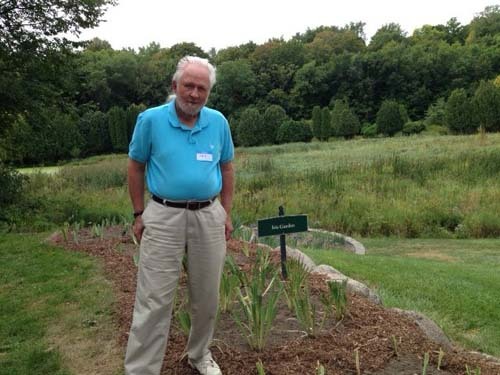 If anyone is really interested in finding species iris, but not having luck doing so, try contacting Jan Sacks or Marty Schafer at Joe Pye Weed’s Garden. 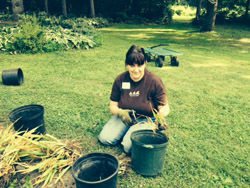 They may be able to help you, as they grow many species iris in their own perennial beds surrounding their home. 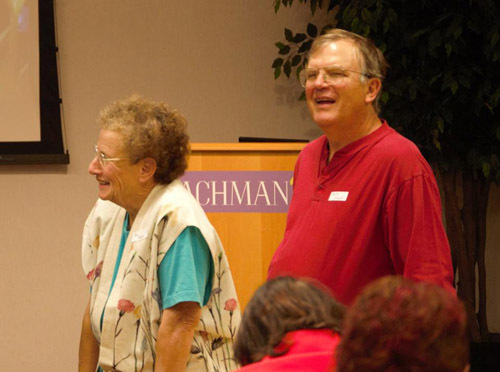 I would like to thank Jan and Marty for two very informative presentations. 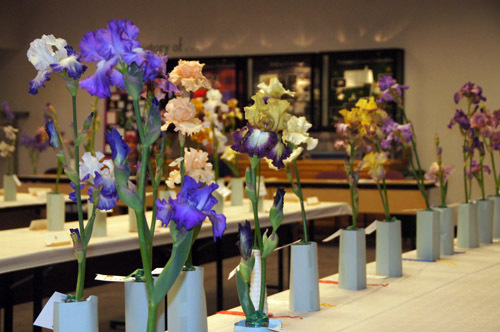 They definitely have a passion for creating new, more improved, varieties of iris! 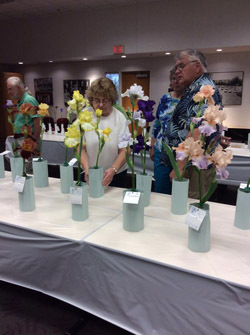 2016 Iris Society of Minnesota Show. June 4. 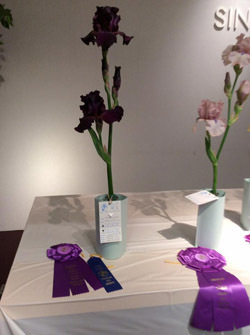 Queen of the Show: TB Hopeless Romantic, entered by Jack Worel. 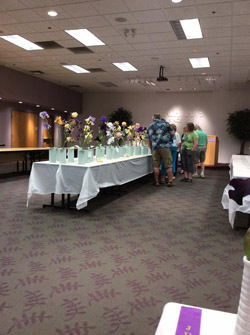 This file is the region 21 announcement of their whirlwind garden tour on May 21,2016, leaving from the greater Des Moines Botanical Garden. They are doing a registration at 8 o'clock on the Saturday morning of the event and vans/buses? will depart at 8:30. 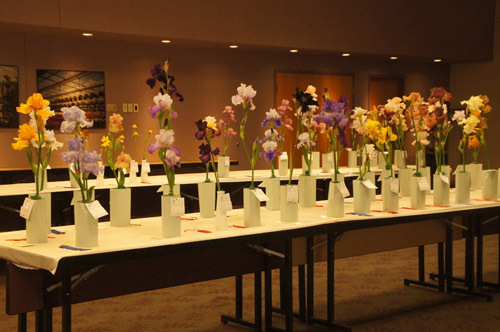 All next years convention gardens are included. 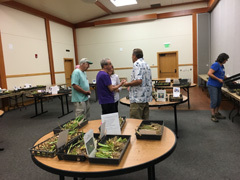 There is supposed to be a judges training during lunch at the Iowa Arboretum near Ames or in the garden right after lunch. 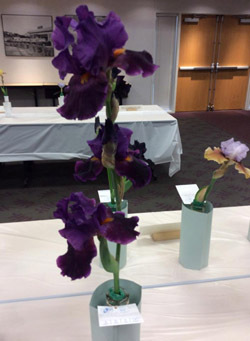 I think this may be of special interest as the iris in these gardens should grow in our gardens in Minnesota and Wisconsin if they grow well in Iowa. 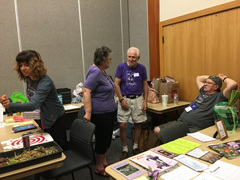 If you plan on attending, please fill out the registration form before May 11th making checks out to Region 21 and mail it to Pam Messer, P O Box 64, Huxley, IA 50124. Also please email Katerina Bergeron to let her know you plan to go as she is coordinating things for Region 8. 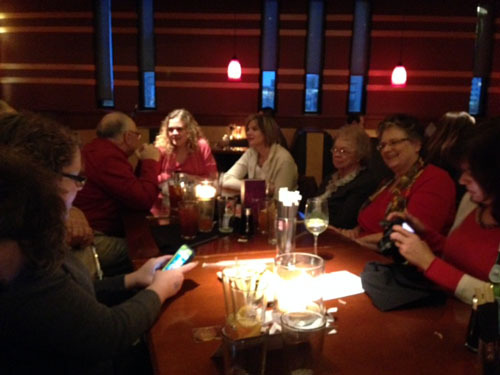 Pam Messer suggested we look at motels in Ankeny, IA to stay on Friday night. She says there are a lot and plenty of restaurants. Their directions on the announcement for Westbound on I-235 will get you to the Greater Des Moines Botanical Garden where the tour begins and ends. 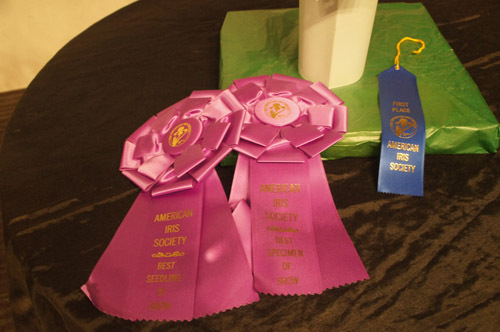 Franklin Cook Memorial Cup at the 2015 AIS convention. 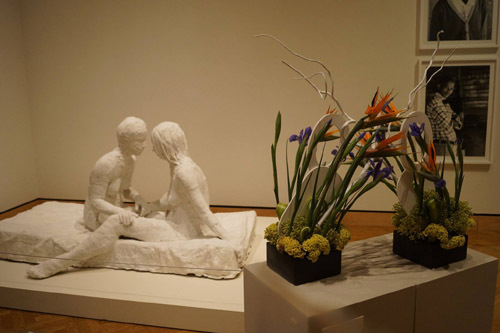 George Segal's "The Girl Friends"
January 24, 2015 at PF Chang in Edina. 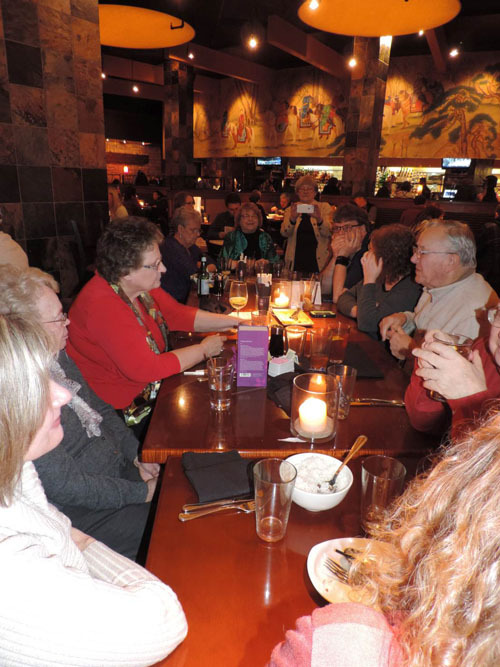 Members enjoyed delicious food and good company. Alicia LaMunion and Jack Worel (in absentia) were presented with AIS medals. 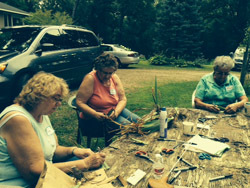 A lightly overcast day was perfect for digging, labeling, and washing many fine irises at Jack Worel's home and gardens. 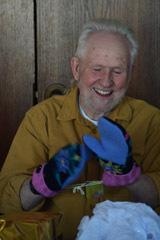 Thanks to Tim and Gerry Moore and Jack and Jan Worel for organizing the proceedings. 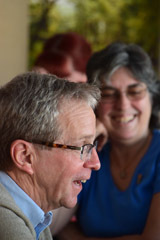 Elsie Riggs did a great job arranging for a superb lunch. 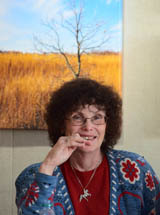 Thanks to her and the others who brought food: Lucy Joyce, Jan & Jack, Katerina Bergeron, Gerry, and Cindy Soule. 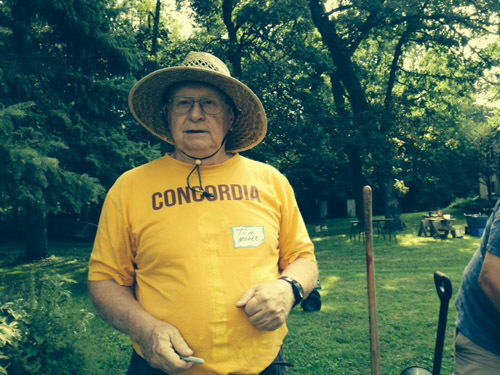 The dig volunteers were: Cindy and Jon Soule, Wally Doehne, Jenn Lanz and her son Devon, Marte Hult, Tony Luce, Judy Clayton, Tatiana Allen, Anne Gillespie Lewis, John Sautner, Toni Fundingsland, Lucy Joyce, JoAnn Metling, Katerina Bergeron, Bob Reed, and Tim and Gerry's granddaughter, Ailsa Schmidt. 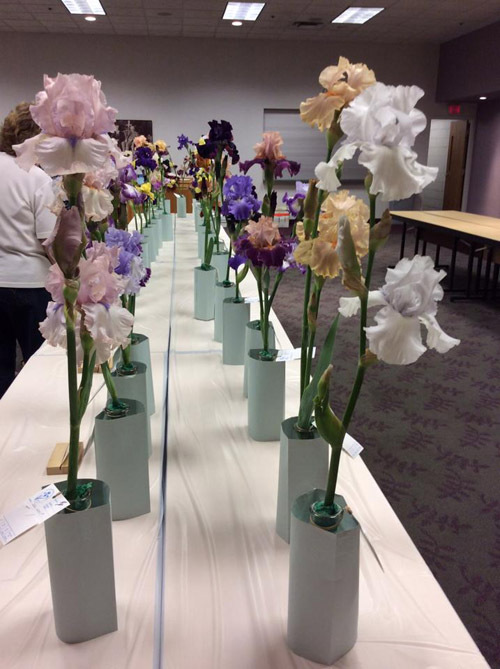 Several people also brought irises for the sale and we will list those along with the volunteers after the sale. 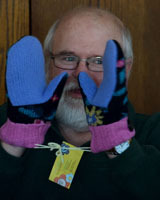 As Gerry said in her email to the volunteers, "Many hands make light work (although I wouldn't say it was light work.)" We are well on our way to having a great sale!! 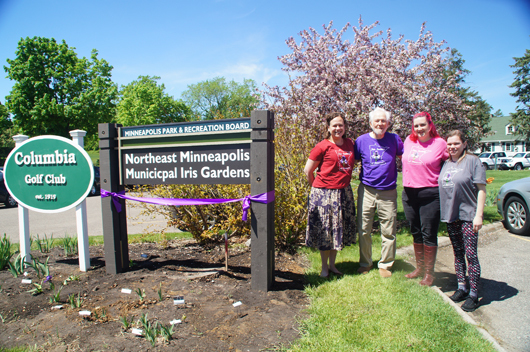 On September 14, 2013, the Society dedicated a new iris bed at the University of Minnesota Landscape Arboretum. 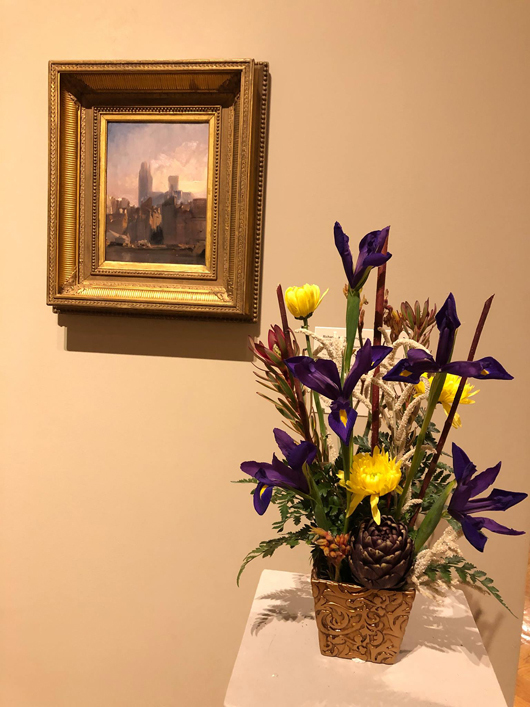 After a picnic lunch, members viewed the new bed and listened to Jack Worel, who donated most of the irises, describe the selections. the dig by 2:30 pm on the 9th. We will need MANY volunteers! 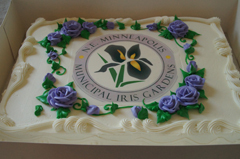 The Iris Demonstration Garden at the MN Landscape Arboretum is a very popular attraction for visitors during June. 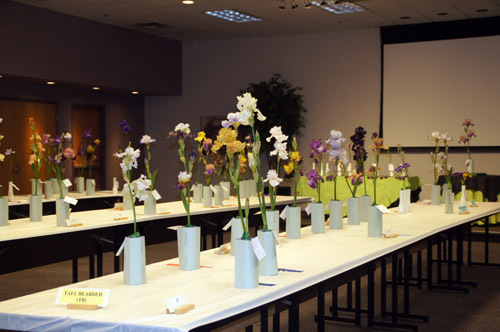 We dig approximately 1/3 of the varieties each year to keep the plants from getting overcrowded. Digging & cleaning the iris is dirty work, but everybody has a good time doing it. 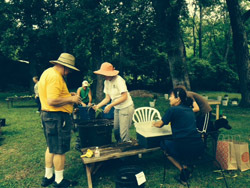 A portion of the rhizomes is replanted (by the Arboretum’s gardeners) but the excess is sold as our fundraiser. 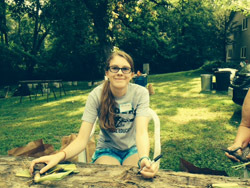 Juice and snack will be available to kick off the dig and Lunch will be provided in the Picnic Shelter for the dig. 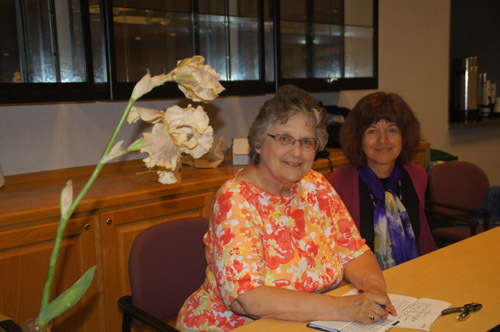 Sales helpers will have to provide their own lunch or visit the Arboretum’s cafeteria. 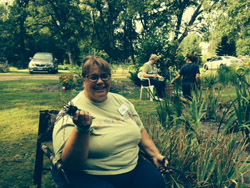 A highlight of the 2014 dig and sale will be an auction of iris rhizomes the club will purchase from Schreiner's Iris Gardens or other vendors. 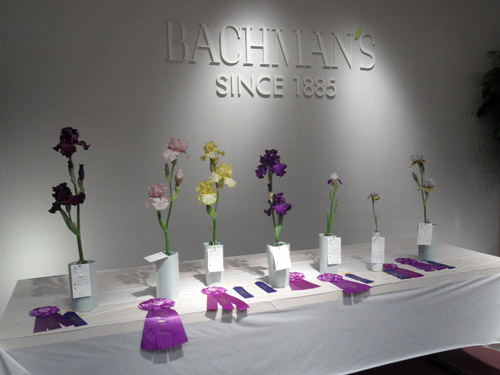 Volunteer workers (ISM members only) can participate in the auction. 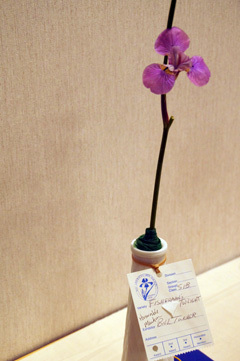 Highest bid will take home the particular rhizome that day!!! 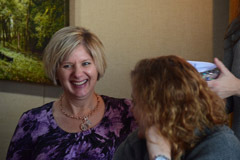 Cash or check will be accepted so come prepared to bid on some newer introductions.